Former president defends agreement he negotiated after current president withdraws US from Iran nuclear deal. 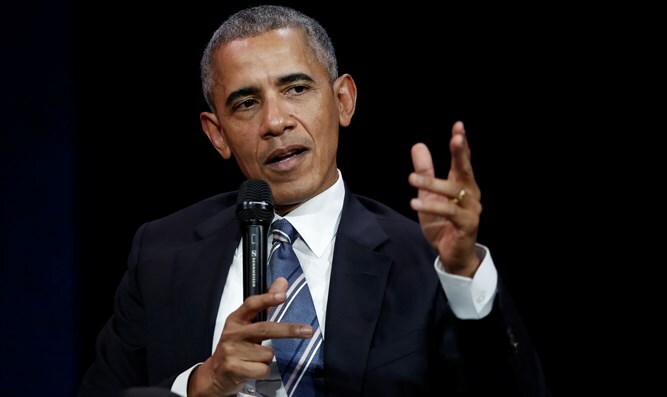 Former US President Barack Obama decried his successor's decision to withdraw from one of his most important foreign policy achievements Tuesday. Obama called President Trump's decision to withdraw from the Iran nuclear agreement "misguided" in a Facebook post Tuesday evening. "The reality is clear. The JCPOA is working – that is a view shared by our European allies, independent experts, and the current U.S. Secretary of Defense. The JCPOA is in America’s interest – it has significantly rolled back Iran’s nuclear program. And the JCPOA is a model for what diplomacy can accomplish – its inspections and verification regime is precisely what the United States should be working to put in place with North Korea. Indeed, at a time when we are all rooting for diplomacy with North Korea to succeed, walking away from the JCPOA risks losing a deal that accomplishes – with Iran – the very outcome that we are pursuing with the North Koreans," Obama wrote. He continued: "That is why today’s announcement is so misguided. Walking away from the JCPOA turns our back on America’s closest allies, and an agreement that our country’s leading diplomats, scientists, and intelligence professionals negotiated. In a democracy, there will always be changes in policies and priorities from one Administration to the next. But the consistent flouting of agreements that our country is a party to risks eroding America’s credibility, and puts us at odds with the world’s major powers." Obama took issue with Trump's assertions that the 2015 agreement is too weak and will expire due to its sunset clauses. "Second, the JCPOA has worked in rolling back Iran’s nuclear program. For decades, Iran had steadily advanced its nuclear program, approaching the point where they could rapidly produce enough fissile material to build a bomb. The JCPOA put a lid on that breakout capacity. Since the JCPOA was implemented, Iran has destroyed the core of a reactor that could have produced weapons-grade plutonium; removed two-thirds of its centrifuges (over 13,000) and placed them under international monitoring; and eliminated 97 percent of its stockpile of enriched uranium – the raw materials necessary for a bomb. So by any measure, the JCPOA has imposed strict limitations on Iran's nuclear program and achieved real results. "Third, the JCPOA does not rely on trust – it is rooted in the most far-reaching inspections and verification regime ever negotiated in an arms control deal. Iran’s nuclear facilities are strictly monitored. International monitors also have access to Iran’s entire nuclear supply chain, so that we can catch them if they cheat. Without the JCPOA, this monitoring and inspections regime would go away. "Finally, the JCPOA was never intended to solve all of our problems with Iran. We were clear-eyed that Iran engages in destabilizing behavior – including support for terrorism, and threats toward Israel and its neighbors. But that’s precisely why it was so important that we prevent Iran from obtaining a nuclear weapon. Every aspect of Iranian behavior that is troubling is far more dangerous if their nuclear program is unconstrained. Our ability to confront Iran’s destabilizing behavior – and to sustain a unity of purpose with our allies – is strengthened with the JCPOA, and weakened without it." President Trump, in his announcement, called the Iran nuclear deal an "embarrassment" that "should never have been reached." He further stated that "after the sanctions were lifted, the dictatorship used its new funds to build nuclear capable missiles, support terrorism, and cause havoc throughout the Middle East and beyond." "The agreement was so poorly negotiated that even if Iran fully complies, the regime can still be on the verge of a nuclear breakout in just a short period of time," Trump said. "The deal's sunset provisions are totally unacceptable."